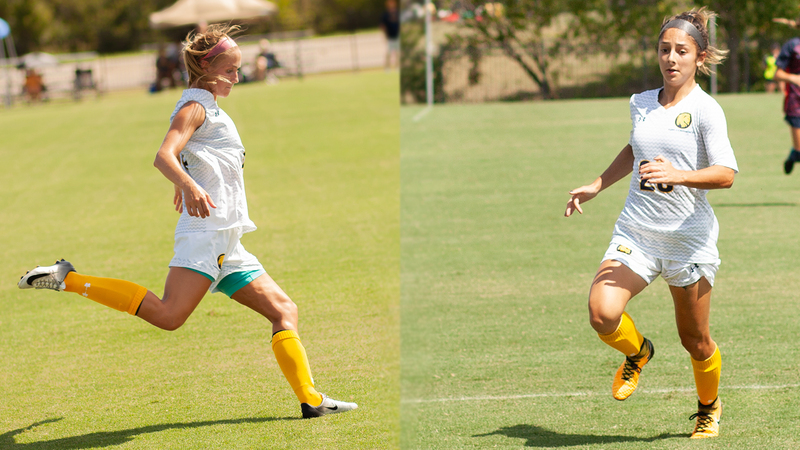 Kotlik earns Second Team All-Region honors, Munguia named Third Team All-Region by USC. KANSAS CITY, Mo.– The United Soccer Coaches All-South Central Region named Texas A&M University-Commerce soccer players Michelle Kotlik and Sabrina Munguia to their teams. Kotlik was named Second Team All-Region while Munguia was named Third Team All-Region. The awards were announced Tuesday by the USC. Kotlik­– a senior from Grapevine– earns her third All-Region award of the season after being named to both the D2CCA All-Region team and Google Cloud CoSIDA Academic All-District team. She was named the Lone Star Conference Academic Player of the Year and First Team All-Conference and had a stellar season for the Lions. She played in and started 16 matches, scoring a career-high six goals, with three game-winners. She also had an assist and had 13 shots on goal. She finished sixth in the LSC in points, fifth in goals scored and fourth in game-winning goals. It is the seventh All-Region award of her career. Munguia– a senior from Baytown (Sterling)– earns the first All-Region award of her career. She was named Second Team All-LSC after co-leading the Lion offense with six goals. She also had an assist. Munguia scored three game-winning goals on the season. She ranked sixth in the LSC in points, fifth in goals scored, and fourth in game winners and ranked fifth in the league in shots. K Kaylyn Smith Sr. University of Colorado-Colorado Springs Monument, Colo.
D Cheyenne Orozco So. West Texas A&M University Rio Rancho, N.M.
D Aleesa Muir Jr. University of Colorado-Colorado Springs Colorado Springs, Colo.
M Tarah Patterson So. University of Colorado-Colorado Springs Colorado Springs, Colo.
M Anna Gregg Sr. University of Colorado-Colorado Springs Sacramento, Calif.
F Jennifer Kendall Sr. Colorado School Of Mines Bloomfield Hills, Mich.
F Hannah Kelley-Lusk So. West Texas A&M University Farmington, N.M.
F Grace Linton Sr. Newman University Valley Center, Kan.
F Reigna Banks Sr. Metropolitan State University of Denver Bakersfield, Calif.
K Shannon Mooney Jr. Colorado School of Mines Broomfield, Colo.
F Whitley Johns Fr. Dixie State University Gilbert, Ariz.
K Jazmine Maxwell Fr. Texas Woman’s University Irvine, Calif.
D Kyra Butler So. Newman University Rapid City, S.D. D Melissa Cardenas Sr. Rogers State University Oxnard, Calif.
D Hannah Parado Sr. University of Colorado-Colorado Springs Ponte Vedra, Fla.
M Nicole LaTourette Jr. Colorado School Of Mines Golden, Colo.
M Bria Salazar So. Rogers State University Glendora, Calif.
F Aimee Kurfurst So. Westminster College (Utah) Vancouver, Wash.
F Tori Rinsem Jr. Regis University Gilbert, Ariz.
Shelley Chapron named Honorable Mention All-American by AVCA. 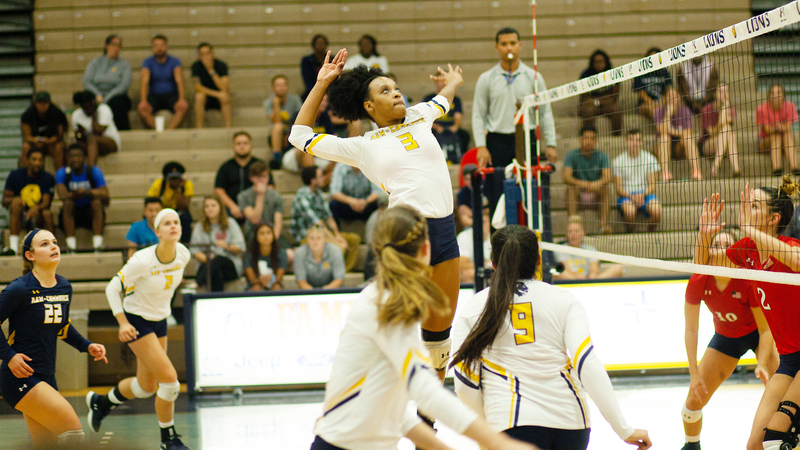 LEXINGTON, Ky.– Texas A&M University-Commerce middle blocker Shelley Chapron has been named an Honorable Mention All-American by the American Volleyball Coaches’ Association. The award was announced Tuesday by the AVCA. It is the second consecutive season Chapron has been named an All-American by the AVCA. Chapron– a junior from Houston (St. Pius X)– had a spectacular season for the Lions, earning First Team All-Region honors and First Team All-LSC honors for the second consecutive season. She was named the Lone Star Conference Tournament MVP and helped lead the Lions to their first conference tournament championship in more than 30 years. She finished the season hitting .374 and led the LSC in hitting percentage throughout the season. She led the team with 361 kills and also had 133 blocks and 15 aces. Chapron was also named AVCA National Player of the Week this season. The Lion Volleyball team had its most successful season in more than 30 years. The team won 30 games for the first time since 1987, finishing with a .833 winning percentage. The team earned the second seed in the South Central Region, making its second consecutive appearance in the NCAA Tournament after receiving an automatic berth after winning the program’s second-ever LSC Tournament Championship. The team advanced to the NCAA Regional Championship game. The Lions were 23-2 in their final 25 matches of the year. 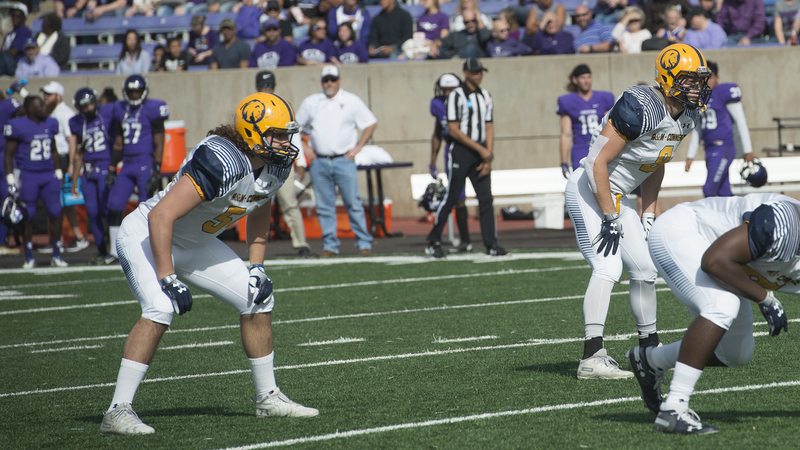 Trey Conrod named LSC Defensive Player of the Week. 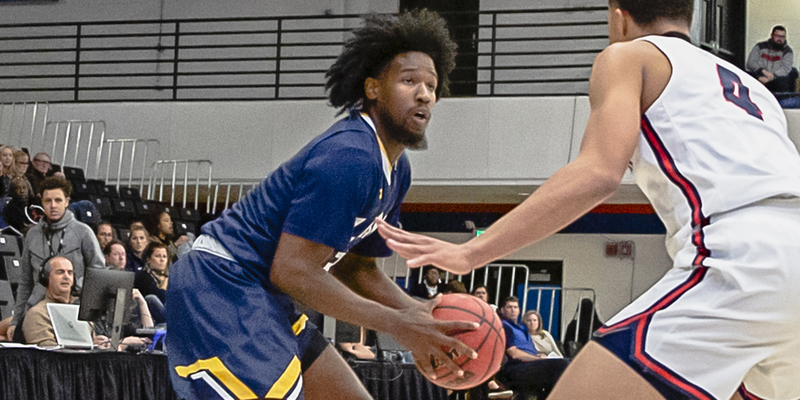 RICHARDSON – Texas A&M University-Commerce senior forward Trey Conrod received the Lone Star Conference Defensive Player of the Week, as announced by the conference office Monday. Conrod – a senior general studies major from Kilgore – was the Lions’ top rebounder and had a solid defense on both the perimeter and interior in a 1-1 week. He had seven rebounds in each game against No. 25 Regis and Metro State and also recorded a block and three steals. He averaged 11.0 points, 7.0 rebounds, and 2.5 assists as well. For the year, Conrod averages 13.0 points and 5.7 rebounds per game, shooting 49.2 percent from the field. The Lions return to action on Thursday in their first Lone Star Conference game of the season. The Lions will host Angelo State at 11 a.m. as part of Education Day, presented by Alliance Bank. Tickets for the doubleheader are available at WeAreLionsTix.com, by calling (903) 468-8756 or by visiting the Lion Sales & Service Box Office in the Field House. 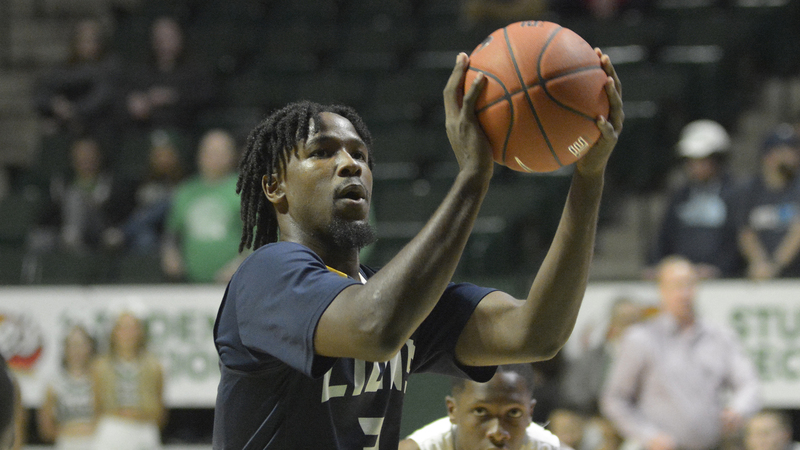 Strong fourth quarter lifts Lions to 76-67 win over Southeastern Oklahoma. 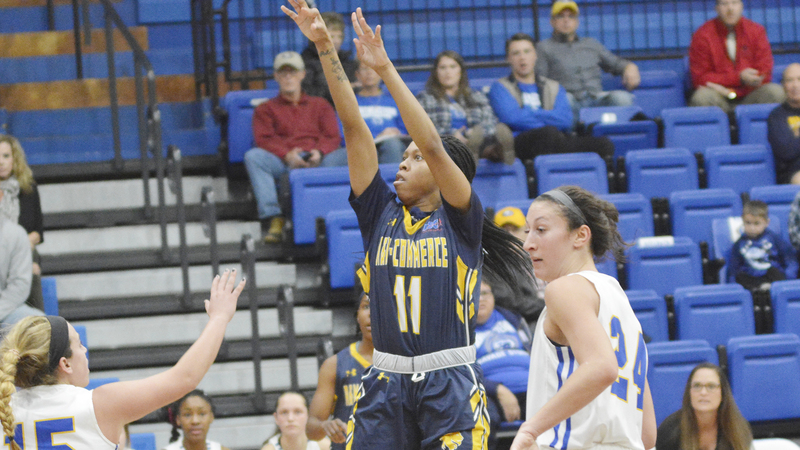 DURANT, Okla.– The Texas A&M University-Commerce women’s basketball team defeated Southeastern Oklahoma State on Sunday afternoon. The Lions trailed for much of the first three quarters but outscored the Savage Storm 20-9 in the final quarter to win. The win brings the Lions to 3-3 on the season while the Storm falls to 1-2 on the year. The Lions return to action on Thursday as they open up Lone Star Conference action. The Lions will host Angelo State at 1:00 p.m. as part of Education Day, presented by Alliance Bank. The game will follow the Lion men’s basketball game, which will begin at 11:00 a.m. against ASU. Tickets for the doubleheader are available at WeAreLionsTix.com, by calling (903) 468-8756 or by visiting the Lion Sales & Service Box Office in the Field House. – The Lions outscored SOSU 20-9 in the final quarter. The Lions shot 54 percent in the fourth while SOSU shot just 19 percent. – Chania Wright (DeSoto) led the team with 13 points, draining three triples. Alexus Jones (Lewisville – Aledo) had 12 points, also making a trio of threes. – Ekaterina Zhibareva (Liske, Russia) had nine points and co-led the team with ten rebounds. Alexis Bryant (Pflugerville) also had ten rebounds. – Princess Davis (Shreveport, La.) led the team with a career-high nine assists and also had six points. Makayla Foy (Edmond, Okla.) and Mykiel Burleson (Pflugerville) had eight points apiece. – 10 Lions scored in the game. – The Lions scored 11 more field goals than SOSU, but SOSU shot 16 more free throws than the Lions. Wright opened up the game with a three before SOSU made seven points in a row to build a lead. The Lions had early turnovers that led to the Savage Storm run. Midway through the quarter, SOSU held a 12-7 lead. Foy hit consecutive jumpers as the Lions cut the lead down to three late. The Storm finished the quarter on a mini-run and led 23-15 after one. The Lions started the second quarter on a 9-0 run. A steal from Agang Tac gave her a basket and a chance for a three-point play. Tac missed the free throw but no one boxed her out, and she got the rebound and laid the ball in the basket. After a defensive stop, Davis found Jones streaking down the sideline for an easy layup. Wright then made a three to give the Lions the lead. The Storm built their lead back up to six before the Lions rallied again, going on a 6-0 run to tie the game at 32. Consecutive threes by the Storm gave them a lead back, and the Lions went into halftime trailing 43-39. Foy led the team with eight points in the half while Zhibareva had seven. Both sides shot better than 45 percent from the field in half. The Lions got to the line just once in the half while SOSU made all eight of its free throws. The Lions opened up the second half with a three before SOSU built its lead back up to seven points during a Lion drought. Midway through the third, SOSU held a 51-44 lead. The Lions then started to crawl back. Burleson scored consecutive buckets in the paint. Maddison Glass also got into the lane as the Lions cut the Storm lead to one point late. SOSU took a 58-56 lead into the final quarter. The Lions took the reins in the fourth quarter, starting the period on a 9-0 run to take the lead for good. Jones hit a three and Wright hit a jumper and scored two from the line. The Lions held a 65-58 lead two minutes into the quarter. SOSU cut the Lion lead back to three, but the Lions would not allow a comeback. The Lions pushed their lead to as many as 12 in the quarter. Lions fall 76-69 in overtime to Metro State on the second night of a back-to-back. DENVER– The Texas A&M University-Commerce men’s basketball team lost 76-69 to Metro State in overtime on Saturday. The Lions trailed by as many as eight in the second half but forced overtime only to fall behind in extra time. The loss brings the Lions to 5-2 on the season while Metro State improves to 1-2 on the year. The Lions return to action on Thursday in their first Lone Star Conference game of the season. The Lions will host Angelo State at 11 a.m. as part of Education Day, presented by Alliance Bank. Tickets for the doubleheader are available at WeAreLionsTix.com, by calling (903) 468-8756 or by visiting the Lion Sales & Service Box Office in the Field House. The Lion Women’s Basketball team will also play Angelo State on Thursday at 1:00 p.m.
– Tyree Robinson (Fall River, Mass.) led the Lions with 15 points, shooting 7-of-9 from the field. He also had five rebounds. – Trey Conrod (Kilgore) had 14 points and led the team with seven rebounds. – Reggie Reid (Harlem, Ga.) and Willie Rooks (Houston – North Forest) both had 13 points. – Both sides shot 44 percent in the game. Metro State got to the free throw line 26 times, including 12 times in overtime. – There were 11 ties and 19 lead changes in the game. It was a back and forth battle early as the lead changed hands several times in the opening minutes. After five minutes, the teams were tied at seven. The Lions then took the lead before Metro scored went on a 5-0 run to take the lead. Midway through the half, the Lions trailed 15-13. The teams went scoreless for several minutes as both sides played good defense. The Roadrunners then pushed their lead to six points, the largest of the half. 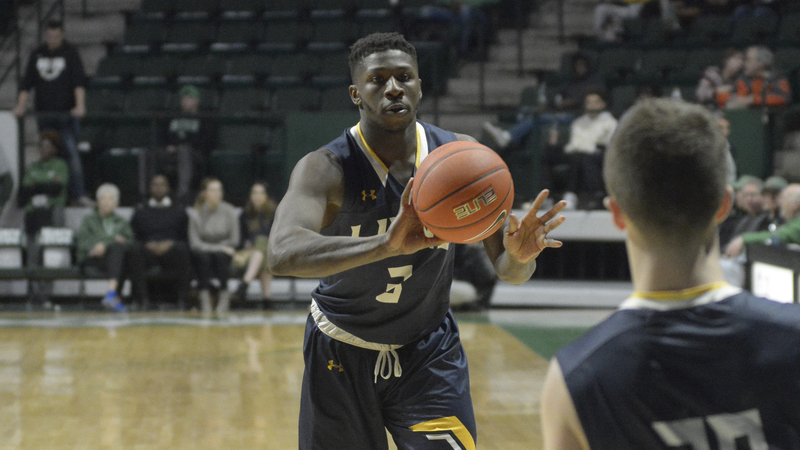 The Lions then went on a 7-0 run to regain the lead, including a three-point play from Tyree Robinson. The lead changed hands several times in the final minutes as both teams battled. Metro State led 32-31 at halftime. The Lions started the second half on a cold streak as Metro State pushed its lead to eight points, the largest lead for either team in the game. The Lions were held without a bucket for more than four minutes. Rooks then caught the hot hand, scoring five points in a row to get the Lions right back into the game. A Robinson layup brought the score to 43-all with 10 minutes left in half. A three from Reid with eight minutes to go gave the Lions the lead once again as the teams continued to battle. With five minutes left, A&M-Commerce led 50-49. Metro State retook the lead again as the teams continued to exchange the points. Reid then hit a three to give the Lions a 55-54 lead with two minutes to play. The Roadrunners regained the lead with 53 seconds left and had the ball. The Lion defense played tough and drew an offensive foul, but their next possession could not find a basket. The Lions were forced to foul. Metro State made both free throws to take a three-point lead with 25 seconds left. The Lions played the odds, hitting a two-pointer and fouling again. The Roadrunners made one of two, and the Lions had one final chance. Driving down, Srdan Budimir found Conrod who nailed the shot to tie the game and send it into overtime tied at 59. The teams traded buckets early in the overtime before Metro State scored six points in a row to take a 67-61 lead. The Lions began to run out of time and had to foul to extend the game, but Metro State made its free throws and left with the overtime win. No. 15 Lions’ fourth-quarter comeback falls short in 34-28 loss to No. 6 Tarleton in Regional Semis. STEPHENVILLE – The No. 15 Texas A&M University-Commerce football team staged a fourth-quarter comeback effort but ultimately fell to No. 6 Tarleton State University, 34-28, in the Regional Semifinal round of the NCAA Division II Playoffs on Saturday. The Lions end their season at 10-3 after reaching the Regional Semifinals round for the third consecutive season. The Lion seniors completed their careers as the winningest class in school history with 43 wins in four seasons, and the Lions won 10 games for the third straight year. The Texans improve to 12-0 and advance the Super Region Four final round. – Kristov Martinez (Edinburg) became the all-time leading kick scorer in NCAA Division II history and set the NCAA Division II Playoff single-game record with five field goals. Martinez went 5-of-5 with two 50-yarders, including a career-high 55-yarder in the third quarter. He finished his Lion career with 449 points and 75 career field goals – both school and Lone Star Conference records. – Garrett Blubaugh (Keller) tied the single-game school record with 21 tackles in the game. He relates the history previously set by Antonio Wilson in 1999. Brucks Saathoff (San Antonio – Reagan) had 16 tackles in the game and forced a fumble. – Kader Kohou (Euless – Trinity) and L.A. Dawson (Austin – LBJ) both had interceptions in the game. – Kane Wilson (New Orleans, La) had 388 yards passing with a touchdown and an interception. He went 25-for-60 in the game and also recorded a rushing touchdown. – Marquis Wimberly (Duarte, Calif.) led the team with 139 yards receiving on seven catches. Vincent Hobbs (Mesquite – Horn) added 89 yards on eight receptions while Ryan Stokes (St. Louis, Mo.) had 87 yards on five catches with an 18-yard touchdown. – The Lions went 1-for-18 on third down and 3-for-3 on fourth down. TSU was penalized 16 times in the game for 112 yards. There were seven turnovers in the game. After the Lions were forced to punt on their opening drive, the Lion defense came up big. Kohou stepped in front of a TSU receiver and picked off a pass, giving A&M-Commerce the ball in the Texan territory. Aided by a defensive pass interference penalty and a long reception from Hobbs, the Lions drove into the red zone before their drive stalled. Martinez punched the ball through the uprights from 19 yards out to put the Lions up 3-0. The teams traded punts twice each before TSU sustained its first drive of the game. A 46-yard rush from TSU quarterback Ben Holmes flipped the field position as TSU had its first drive in Lion territory. The quarter ended with the Texans driving into the red zone. The Lion defense held Tarleton scoreless in a quarter for the first time since September 22, 32 quarters. With the change of the quarter came a change in the direction of the field. Having had the wind blowing at their backs, the Texans were now going against the wind. The Lion defense forced fourth down, and TSU went for it. The Lion defense stuffed the rush, holding TSU without points. After a three-and-out from the Lion offense, TSU again drove into the red zone. The Lion defense held TSU out of the end zone, forcing a field goal attempt. The teams were tied at three with 11:40 to play in half. The defensive battle continued in the second quarter as both teams’ offenses could not sustain drives. Punts concluded four consecutive. TSU then caught a break as a punt dropped in front of the Lion returner but hit a Lion blocker and was covered by TSU. The Lion defense again made a play. On a fourth down conversion attempt, Saathoff clogged the middle and stripped the Texan rusher of the ball, and the ball was recovered by Kohou. The Lion defense could not convert a first down and was forced to punt again. However, TSU fumbled the punt return, and the Lions recovered. The Texan defense forced the Lions backward, but Martinez converted the field goal from 38 yards out to give the Lions a 6-3 lead. This field goal gave Martinez the LSC scoring record, and NCAA Division II kick scoring record. The TSU rush attack finally broke through on their next drive, as a 47-yard rush put the Texans in scoring position. Three more followed and TSU punched the ball into the end zone, taking their first lead of the game, 10-6. After a Lion punt, TSU drove down the field again. After two rushes, the Texans found a wide-open receiver, who ran the ball 64 yards into the end zone. TSU took a 17-6 lead. After a good return from Ramsey, Wilson completed consecutive passes to get the ball into range for Martinez, who pushed the ball through the uprights from 33 yards out to send the Lions into halftime trailing 17-9. – The Lions were held to negative six yards rushing in half, including four quarterback sacks. TSU had 212 rushing yards in the first half. – Saathoff had 11 tackles in the first half, including three for loss. – The Lion defense held TSU to 3-for-10 on third down and 0-for-2 on fourth down. The Lion offense was 0-for-9 on third down. After the teams traded punts on their first drives of the second half, the Lion defense again came up with a play. On an attempt down the right sideline, Dawson picked off a pass at midfield. The Lions got into range for Martinez, who hit a career-long 53-yarder to cut the TSU lead to 17-12. Then TSU hit two long pass plays in a row to drive the ball down the field. Two more rushes pushed the ball in, and TSU increased their lead to 24-12. Two TSU penalties and completion to Hobbs brought the Lions across the 50 and Martinez again lined up for a long field goal attempt. This one was good from 55 yards, re-setting Martinez’ school record and bringing the score to 24-15 in favor of Tarleton. After TSU drove down for a field goal inside the red zone, the Lions sustained a drive for the first time in the second half. Three long completions from Wilson took the Lions into the red zone. However, an errant pass was intercepted by TSU. The Texans held a 27-15 lead heading into the fourth quarter. TSU had a 43-yard touchdown rush early in the fourth quarter to push their lead to 34-15. The Lion offense then began to find its rhythm. Wilson hit many throws, including a 34-yard completion to Wimberly. Close to the goal line, Wilson rushed the ball in from three yards out. The Lions failed to convert the two-point conversion and trailed 34-21 with 8:55 to play. The Lion defense forced a punt on TSU’s next drive, and the Lion offense again went driving. Wilson hit Hobbs for a 17-yard gain and then found Stokes for a 42-yard completion. Wilson then found Stokes again for an 18-yard touchdown to cut the TSU lead to 34-28 with 5:37 left on the clock. The Lion defense forced a three and out, stopping three runs short of the first down marker to give the Lions an opportunity to win the game on offense. On the first throw of the drive, Wilson hit Wimberly for an over-the-shoulder grab for 34 yards. Wilson then hit Hobbs for another big gain. Inside the 30, Wilson took another snap but was forced out of the pocket and was stripped of the ball. TSU rushed three times and this time picked up just enough for the first down and ran out the clock. DENVER – The Texas A&M University-Commerce men’s basketball team recovered from a halftime deficit to pick up an 83-69 road win at No. 25 Regis University on Friday evening. The Lions are now 5-1 overall this season, while Regis falls to 2-2. The game was the first of two consecutive true road games in the Hilton Garden Inn Denver Cherry Creek Classic. A&M-Commerce will take on Metro State (0-2) at 6:00 p.m. CST (5:00 p.m. in Denver) to conclude the event. – Reggie Reid (Harlem, Ga.) led the Lions with 17 points. – Tyree Robinson (Fall River, Mass.) netted 16 points, with 12 in the second half. – Willie Rooks (Houston – North Forest) scored 13 points. – Austin Grandstaff (Rockwall) and Deonta Terrell (Chicago, Ill.) each scored nine points. – The Lions trailed 37-31 at halftime before exploding for 52 points in the second half. Full game details will be available Saturday, as Regis’ statistical crew experienced technical difficulties courtside.